Working as a team, Irene and her dogs have earned over 95 working titles in Obedience, Field, Rally, and Agility. Accomplishments included multiple HITs, OTCHs on 6 dogs, MOTCHs on 3 dogs, several UD's from the AKC and UKC, competing at the HIT of HITs multiple times in Open and Utility, and ranking in Canada’s Top Ten Obedience Dogs. Irene has instructed obedience classes for 25+ years on an occasional basis ranging from Beginners to Utility. 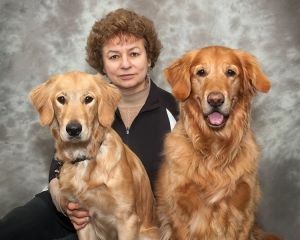 She is a lifetime member of the Canadian Kennel Club and North York Obedience Club, and a member of Cross Country Tracking Club, Oshawa Obedience Club, the Golden Retriever Club of America, and an endorsed member of the National Association of Dog Obedience Instructors. Over the years, 8 of her dogs have served as therapy dogs visiting senior/nursing homes and group homes for physically/mentally challenged children.